Enter your email address and get to play a round of golf at 5-6 courses through the GolfPH Buddy Pass! 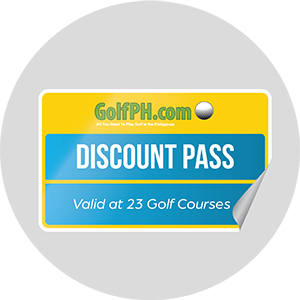 For a limited time, we are offering a Free 1 Time Use GolfPH Discount Pass. With this pass, you get to save money and play at any one of the 5-6 Golf Clubs listed below without being a member. This offer is for a 1 Time Use only. This offer is only available for Non GolfPH Members and is limited to 1 per person. Must make a Reservation at least 48 hours prior to preferred date.